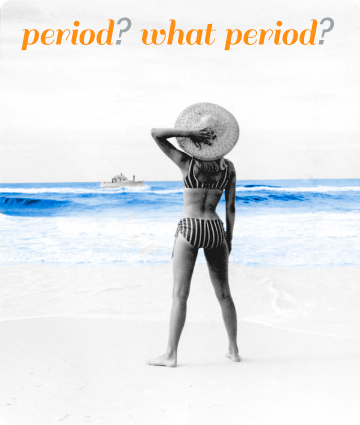 What To Do With The Period Blues? Once I cotton on to PMS being at the root of a dark mood or my being unreasonably angry or bouts of tears, I feel relief. Once I count ( on my fingers) back a few weeks and… Light bulb! It’s flippin’ girl trouble, I can then get back to said mood, anger, tear jag with the knowledge that I have impunity! It’s PMS. I’m not fussed with PMS. It’s the actual period that pisses me off no end. I hate, hate, hate the grinding pain, the bloating, the mess, the need to go to the chemist for period gear, the jerk awake in the middle of the night to run to the loo for a knicker check, having to cut off tampon strings so I can go to the beach or pool and not have a wardrobe mishap. Yes that’s right I still go to the beach and pool. I do not like to let being on my cycle keep me from doing what I want- when I don’t want to do something I’ll let that yoke and chain work for me. I’m getting on with my day. I don’t give periods and PMS much thought once I’m done with them. Most times I’m scrambling through emergency supplies as I haven’t noticed the passing of days. The nurse at my last doctors appointment told me I ought to know the date of my last period as it, and, they are important. I don’t think that I could stop my attitude to this blight and begin marking the event on a calendar- mental or paper. Once the cycle is over I’m not giving it a second thought.